The last time we went to Lynford Arboretum to look for the juvenile Two Barred Crossbill (the one that Matt and me had seen a few days previous) we dipped. So when reports started appearing of adult Two Barred Crossbills joining the juvenile we couldn't help but head back over for another look. So on the Saturday the 21st of September John Friendship-Taylor, Sam Candy, Jon and Kirsty and myself met up nice and early in the morning and started the drive to Lynford Arboretum. we arrived on site and wandered over to the visitor hut to wait patiently for Crossbill flocks and we didn't have to wait long until a few started to pour into the tall trees at the entrance. They didn't seem too shy as they fed among the trees but getting a good look at all of them was a bit of a pain as they worked their way around the branches. It wasn't long though before they all flew up and into the trees behind us and after a quick scan I managed to see a juvenile Two Barred Crossbill which was then joined by another one. Great stuff! Everyone managed to get views in our group before they all flew up and over towards the trees out of sight further back towards the road. We also met another Northants birder there in the shape of Andrew Dove which was nice (even if I was so transfixed on finding the Two Barred Crossbills I didn't recognise him straight away - ha ha sorry Andrew!) 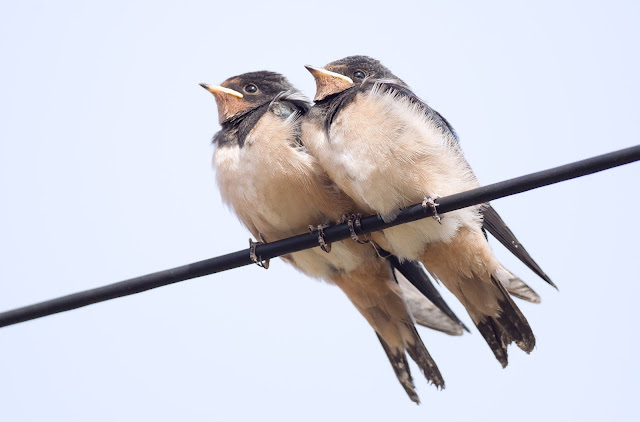 A couple of male birds had been reported in the week and we did really want to see those so we hung around for quite a while longer. 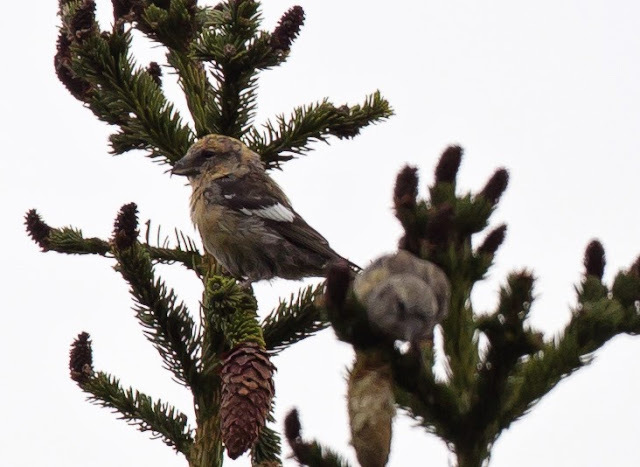 Gradually flocks came and went and the juvenile and adult female Two Barred Crossbills showed very well on and off but you had to be quick when getting pics. Jon let me use his 500mm lens to get pics of a juvenile and he got a cracking pic of the adult female sat high in a tree. We then waited a little longer and it was absolutely worth it. A fairly sizeable group of twitchers had accumulated during the morning and Common Crossbills still kept coming and going but then a bigger group of birds arrived and started to feed in the trees. I left the group and headed a bit further along to get a view from the back of the trees and it wasn't long before I had another juvenile and then as I scanned with the binoculars I saw a very crimson looking male Two Barred Crossbill. I never did manage to see it in the scope as it was so mobile keeping up with it in the bins was a challenge in itself. 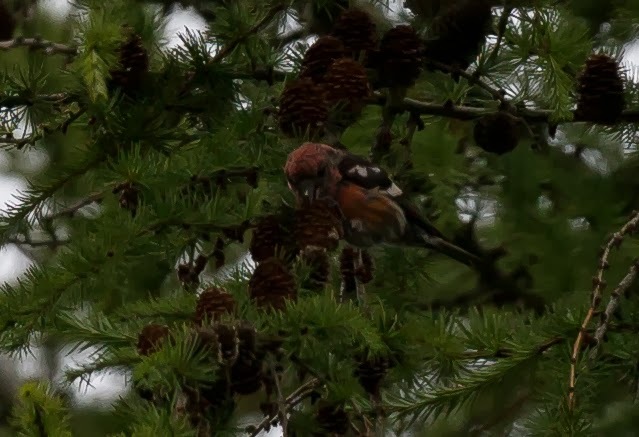 Jon Philpot walked over and he saw it too just as it then got into a squabble with a female Common Crossbill and they flew up and circled each other into the tops of the trees. 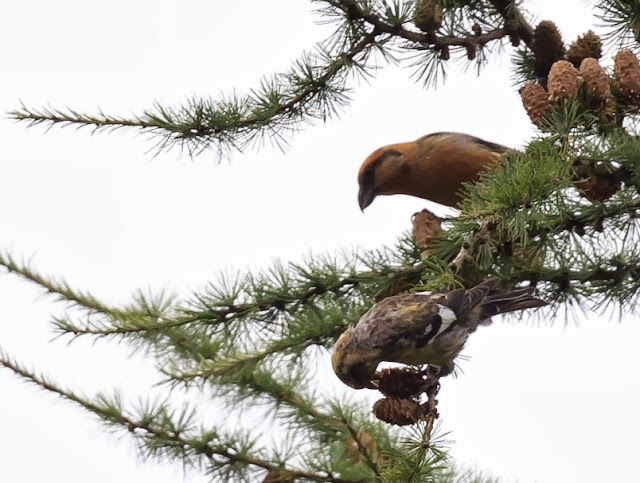 We were then treated to the trumpeting call of the male Two Barred Crossbill showing just how different it was from the many chipping Commons. Jon managed to grab a pic of the bird which is below. 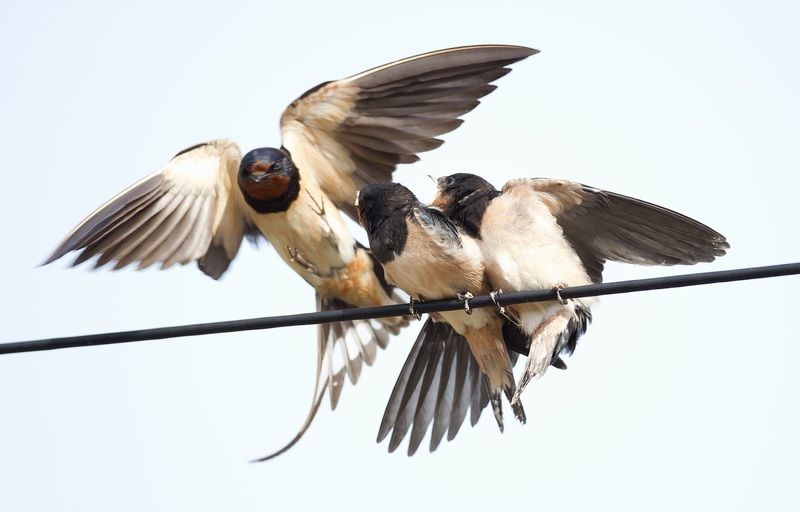 John Friendship-Taylor had also managed to find another male for the rest of the group of birders at the front of the trees. More birders came along and as I had managed to get the scope on the juvenile that was still here they all had a look and connected pretty quickly. It became fairly clear that we had exhausted the site and saw all the birds we had wanted to see. In the two hours we were there we had seen two males, one female and one (but almost certainly two) juvenile Two Barred Crossbills! We headed up to the coast after this to look for the Red Backed Shrike that had been found a few days previous at Walsey Hill. We arrived on site and noticed a group of birders on the top of the steps overlooking Cley Marshes. 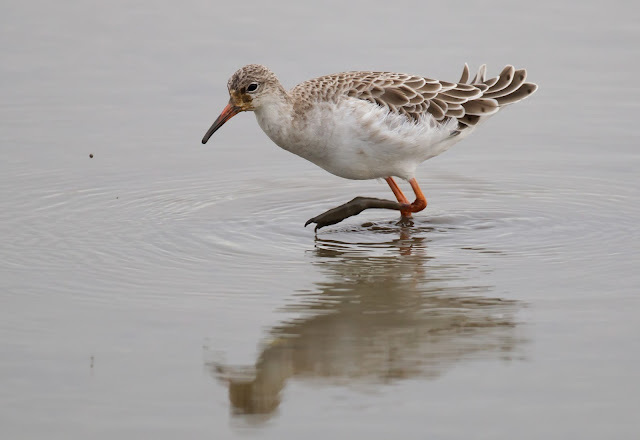 The bird had been reported all morning showing at the opposite side of the reserve which was a bit disconcerting. We headed up to join them and they said they had seen the bird fly over to Cley Marshes and land in a tree near the beach bank, it had then disappeared from view! Our hearts sank but as we had arrived we had noticed a group of birders still looking through binoculars at the south side of the reserve so after a bit of a scan I decided it would be a good idea to go and have a word with them. 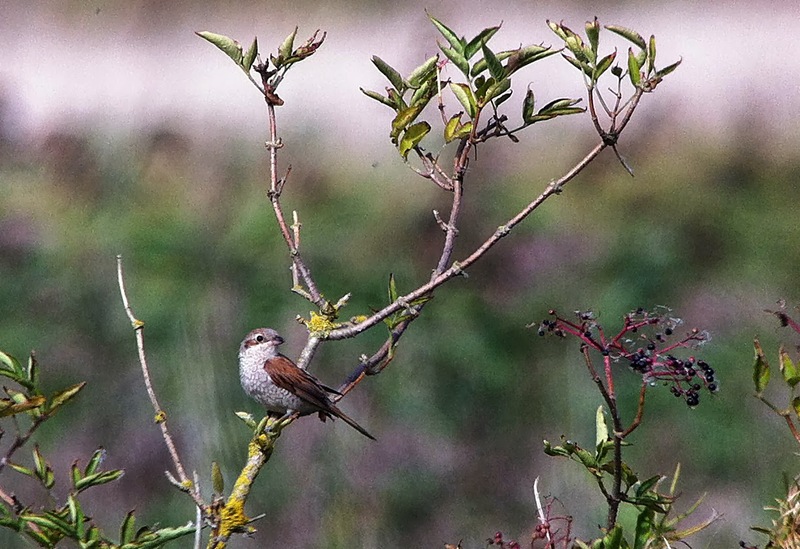 I left the group and walked over saying I'd ring if I heard anything of it's whereabouts, and as I approached I met a couple heading back and asked if they seen the Shrike. They looked puzzled and said yeah it's still there! I guess I then looked puzzled and said we had just been told that it had been seen flying away from the reserve and the gentleman and his wife said it hadn't moved from where it was all morning! A serious lesson is to be learnt here as if we had listened to the people on top of the hill we may very well have just left empty handed. God only know what the people up there had confidently said was the Shrike but it wasn't it and they've obviously walked away ticking something else entirely. Even if you are told a bird isn't present it is always worth birding the site just in case as although I have met some incredibly good birders at twitches I have also met some incredibly bad ones too! Anyway I'm drifting from the point, I headed around the corner and swaying backwards and forwards on a twig was the female Red Backed Shrike. I quickly called Sam to get the other round here and it wasn't long before we were all on the bird. It posed nicely for pics even though the distance made phonescoping a nightmare. 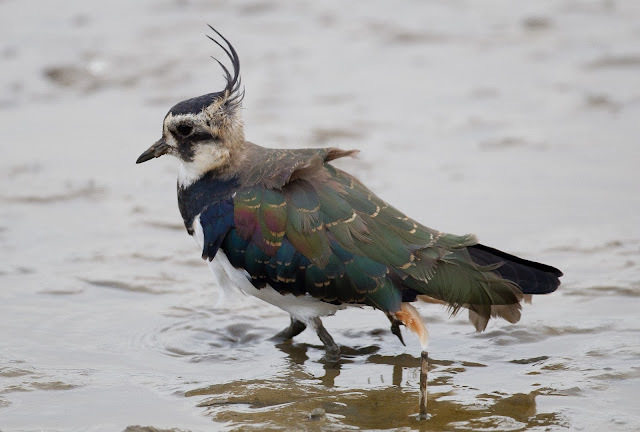 We spent the last part of the day at Titchwell RSPB where lots of waders were present. 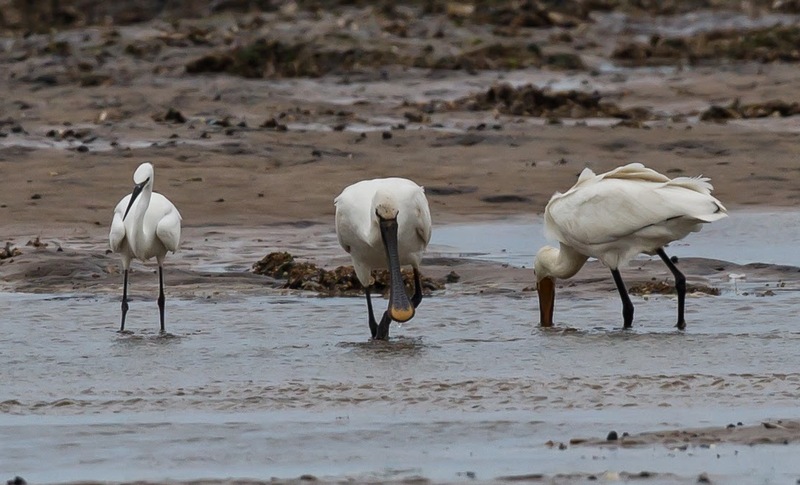 A wander to the beach and back is always a nice end to the day and although we didn't see anything outrageous we did get good pics of Spoonbills. The amount of waders was great to see with the odd Curlew Sandpiper and Little Stint in amongst the many Dunlin. A nice looking Snipe snoozing away capped the day of nicely, although obviously a very common bird it's always nice to get close to one. 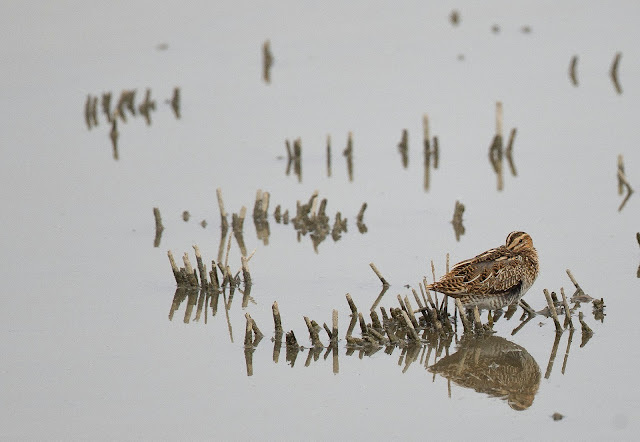 Common Snipe, Titchwell RSPB, Norfolk. We ended the day here and headed home. The plan for the following day involved a "lay in" in the morning and a trip to Bedford town centre to hopefully see the Spotted Crake that had been showing near the embankment. We (Sam Candy, Jon and Kirsty Philpot and myself) set off about 10am and we found ourselves on site fairly quickly after trying to navigate around Bedfords town centre road network. We walked around the lake getting some funny looks off the passers by as we wandered around with lots of optical gear, and evetually we found the area the bird was in. 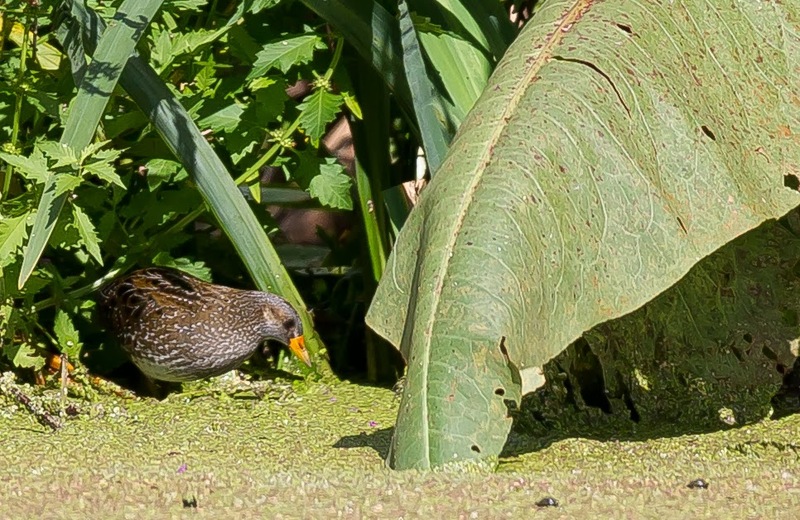 We found a group of birders who were already on the bird and we connected pretty quickly before the bird (in a typically Spotted Crake fashion) shot back into the undergrowth. We waited a while before another birder managed to relocate it just around the corner and viewable from the other side of the lake. 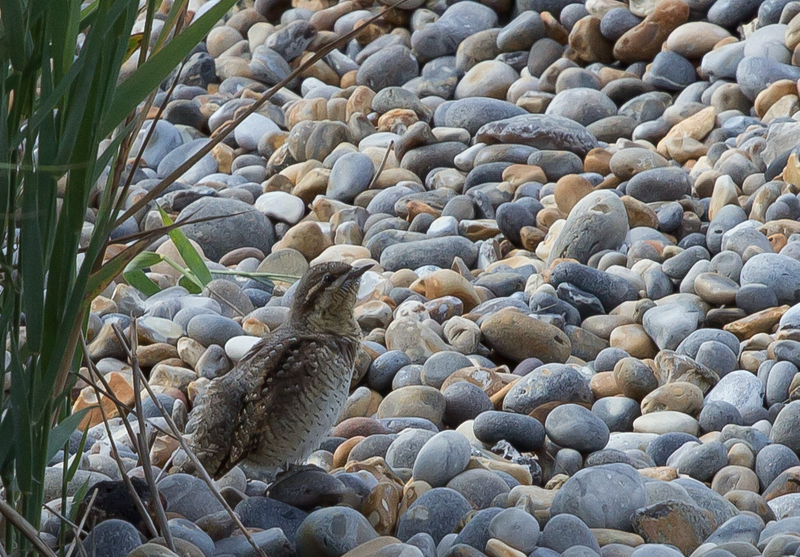 We headed round and spent the next hour or so getting incredible views of this very secretive little bird. It did spend a lot of time in the vegetation preening away before coming down to the waters edge to feed on Black Pond Snails. We all got magnificent views through the scopes and we even managed to get shots as although we were on the opposite side of the lake we were still fairly close. Jon once again lent me his camera to get the pic below. Spotted Crake, Longholme Lake, Bedford. We watched the bird for a couple of hours before we decided reluctantly to leave. I certainly think me and Jon could've spent all day watching it. We then went to Pitsford water and managed to see the Ruddy Shelduck wandering around in amongst the geese. Although you cant add them to your British list they're still a nice bird to see all the same, and as it was such a nice day we retired to the pub and had a few beers in the garden. It had been another great and successful weekend and not only did we see the birds we wanted to see but we all got amazing views of them too! An awful lot has happened since the last post and I have seen 3 new butterflies and 3 new birds. I also had the company of a good friend of mine called Matt Whitelocke (my friend who lives in the Highlands in Scotland and helped me and John Friendship-Taylor see all the birds in Scotland at the beginning of the year) who had traveled down to spend a week wildlife watching down here. 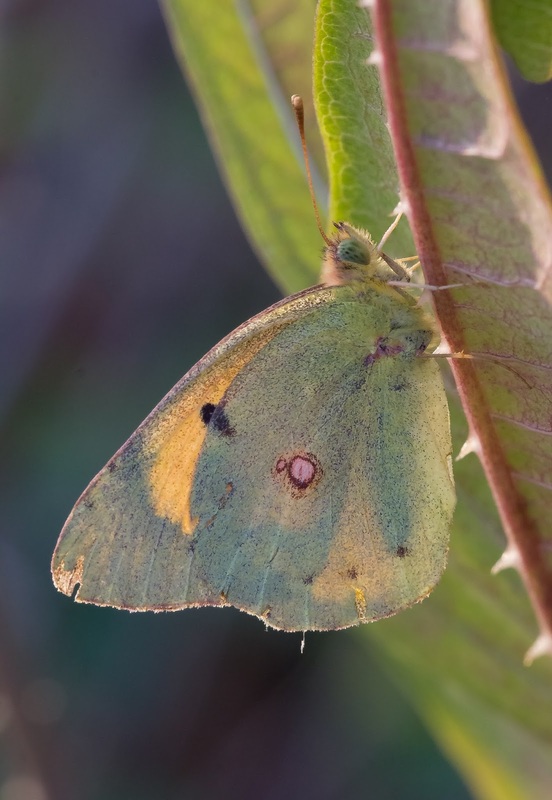 Clouded Yellows at Grange Park, Harrington and Summer Leys. The weekend before Matt arrived John Friendship-Taylor and me spent a large part of the Sunday the 25th August at Harrington Airfield. Unfortunately birds were in very short supply but the mood was lifted by the sight of three Clouded Yellows flying around between the first bunker and the road. 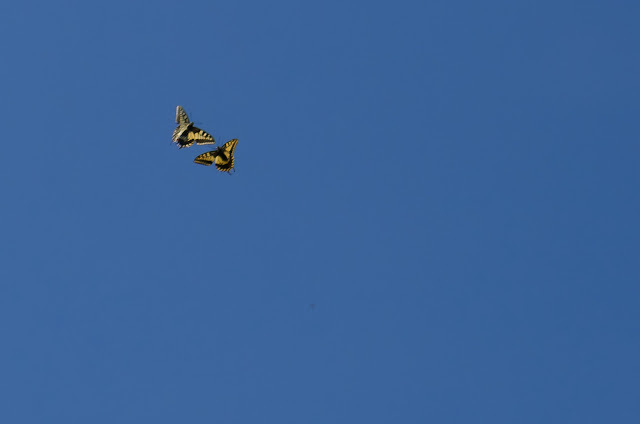 Two of them were behaving in a distinctly Clouded Yellow way and not stopping for nothing but one was very showy. In fact I must have walked 50 feet through the undergrowth on my knees as I snapped away at it. It busily feed from flower to flower without much notice of my lens just inches away from it and at one time was joined by another one allowing to get two on one flower. 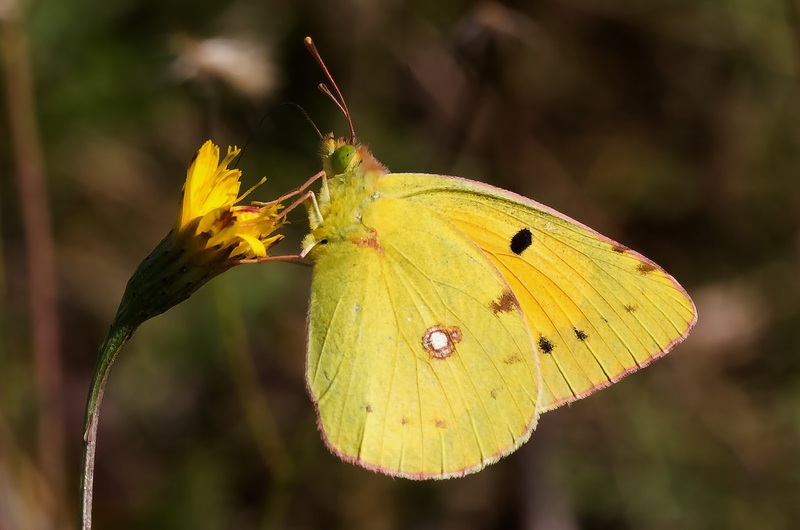 Clouded Yellow, Harrington Airfield, Northants. 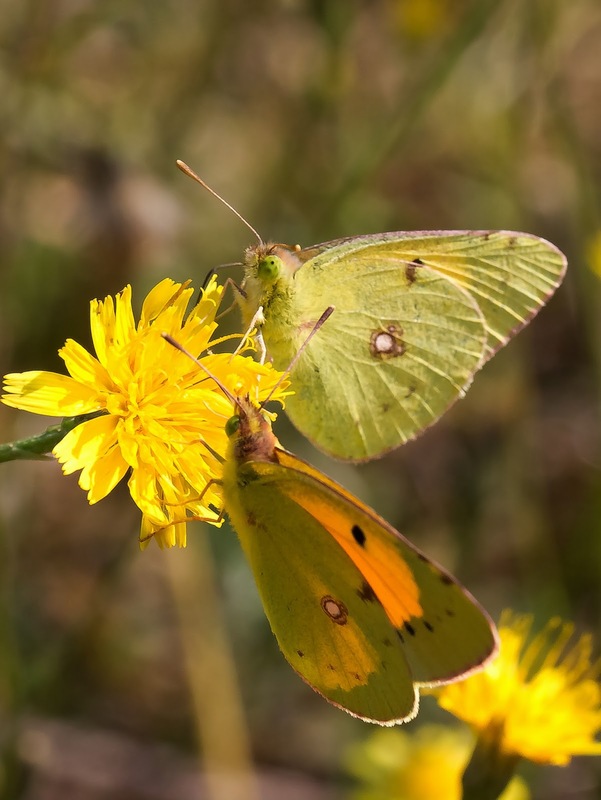 Clouded Yellows, Harrington Airfield, Northants. We left here and headed to Earls Barton Gravel Pits where we had another Clouded Yellow in front of the Pioneer Hide at Summer Leys and another along the disused railway line opposite the reserve. 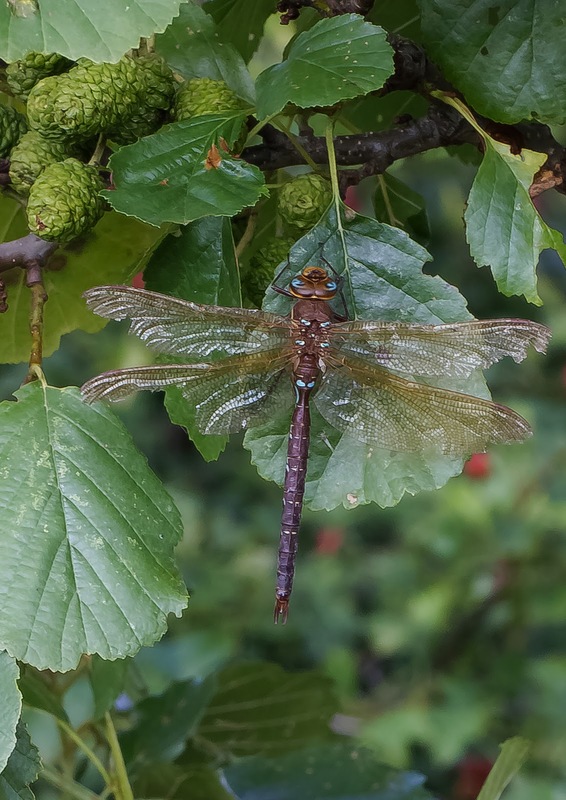 We also had this slightly tatty looking Brown Hawker. Brown Hawker, Earls Barton GP's, Northants. Matt was due to get to my house the following Tuesday and as a lot of my wildlife watching social circle hadn't met him before a beer in the evening had been arranged so on the Tuesday lunch time I left my house a nipped to my local shop to get the beers in. I had always fancied having a look at the wasteland opposite the estate where I live (Grange Park in Northampton) and as lots of migrant Redstarts and Whinchats were being reported about (and I had a couple of hours to kill until Matt got here) I thought I'd have a look. 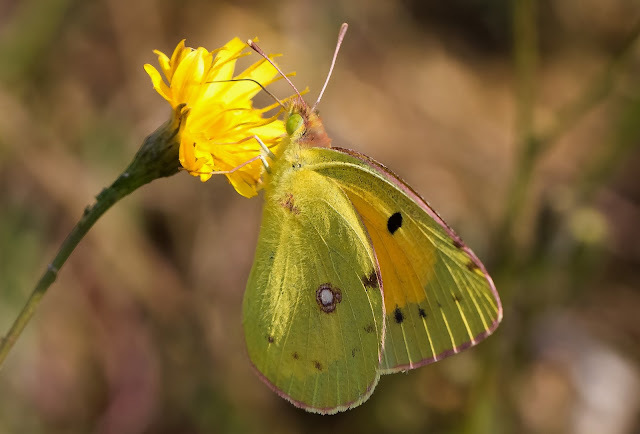 As you may have realised from my previous post about Clouded Yellow butterflies they were a "lifer" until a few weeks previous and during that time I had read a lot about them, particularly noting that their food plant was trefoil. So when I started to explore the area and immediately saw trefoil growing along the footpath near the road I couldn't help my mind from wandering from birds onto butterflies. As I looked over the waste ground from the top of the ridge where the footpath goes I noticed a sea of yellow Trefoils and it wasn't long before I saw a Clouded Yellow whizz passed! "Wow I thought", I had just found my first Clouded Yellow at a different site to any of the others already reported. I admit I did walk further along a with a triumphant spring in my step and then I saw it whirl passed again. This time though it had come from a different direction and as I turned around there were two more. This was getting good, I had found three Clouded Yellows so this must be worth reporting! I walked around the top end of the field and kept seeing more and more Clouded Yellows thinking these can't all be the same ones surely. I stopped and scanned with my binoculars and reached a total of 15 on the wing at the same time!! More and more were being seen as I continued my walk but counting them was a nightmare. I then received a text to say Matt was nearly at mine so I nipped home and within an hour we were both back at the site. 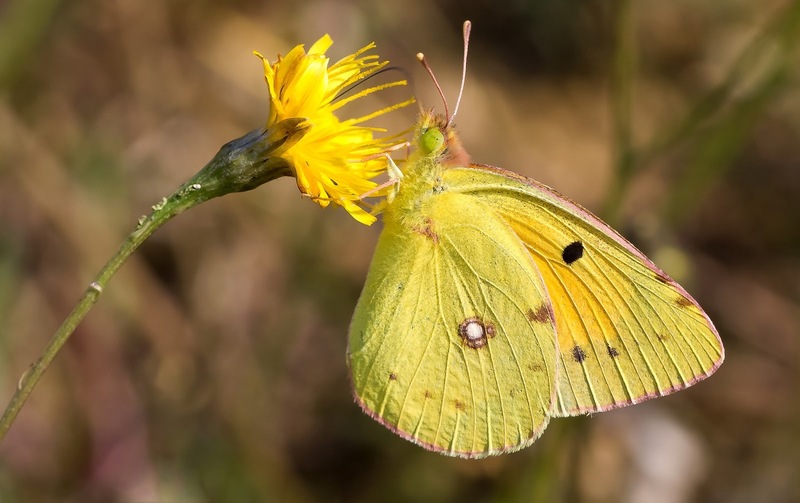 It was agreed by both myself and Matt that at least 20 Clouded Yellows were present and no doubt there were more as everywhere you looked little yellow specks were flying over the ground. As I had already got some pics at Harrington I let Matt have the lions share of the photo opportunities and we even managed to see one on one of the wild Buddleia's in the area allowing Matt to get some shots. Later on in the afternoon more people came to see them with Jon and Kirsty Philpot and Ian Pretty and family too. We watched as they gradually flew up underneath leaves and retired for the evening. Small Heaths and Common Blues were also settling down for the night. Clouded Yellow, Grange Park, Northmpton. 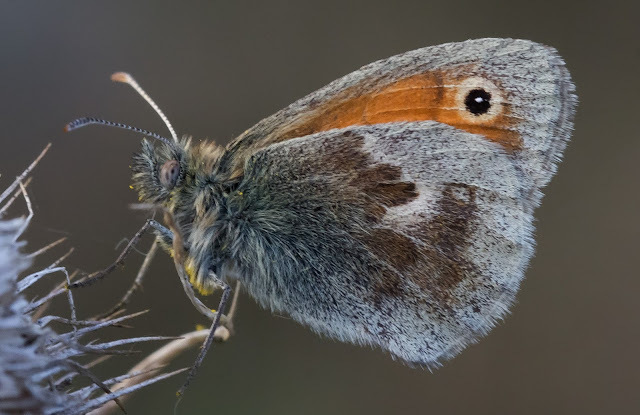 Small Heath, Grange Park, Northampton. During the following few days I returned here a number of times. The highlight was seeing a pale female (Helice) whirl over the site which was also seen by at least two other observers over two days but unfortunately she wasn't posing for photographs. The numbers of the Tuesday were never matched and they at least halved overnight. It was an experience I won't ever forget though! I had already planned to take Matt to Norfolk weeks ago and luckily there had been a fall of birds over the previous weekend. There was another reason too as the friends we were staying with (Keiran and Leila) are getting married soon so it was nice to meet up with them to wish them luck. On the way we decided to nip into Lynford Arboretum to see if the juvenile Two Barred Crossbill (found by Kieran a week previous) was still there. It hadn't been reported for nearly a week but we thought we'd give it a bash all the same. We walked out of the car and could already hear the "chipping" calls as we headed to the visitor centre. We set up the scope and waited patiently as groups of Common Crossbills came and went. Eventually a group landed in a tree just out of sight and started to gradually move into a tree right out in the open. Males and Females moved in and started to feed and then a juvenile bird landed upside down on a branch and as it moved around I could see the large white wing bars. It then helpfully flitted up onto the top of the tree and posed side on and me and Matt got great scope views of it in the sun. A lifer not 15 minutes from getting out of the car! From here we headed to Strumpshaw Fen RSPB reserve with the hope of Swallowtail and the added benefit of a Wryneck that had been found on the previous weekend. We got the directions of the Wryneck first and headed straight here. We found a small group of people standing in the path along the river near the Pumphouse and as we got closer we could see what they were looking at. 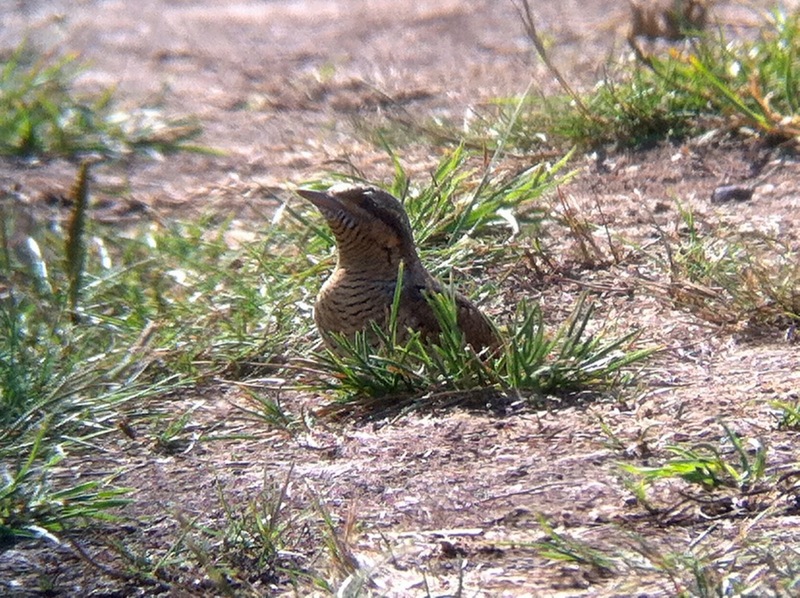 Sat in the middle of the path not 15 feet away was the Wryneck. We got unbelievable views as it crept along and fed in front of us. Wryneck, Strumpshaw fen RSPB, Norfolk. After getting our fill of this bird we left and headed over towards the Tower Hide where we had heard that Swallowtail butterflies had been seen over the last few days. These are second emergence butterflies and I have spent years hoping to see one but unfortunately every time they are out earlier in the year I seem to be elsewhere and I have missed them. It was nice then to hear they had been seen and Matt and me had all the rest of the day to wait to see them. Luckily a couple of very helpful guys we met offered to help us and and pointed us in the direction of the large Buddleia's along the river. Me, Matt and one of the guys waited by one which had two Swallowtails just moments before and then after half an hour or so the other chap came running round the corner panting away to say he'd seen them by the Buddleia closer to the Tower Hide. 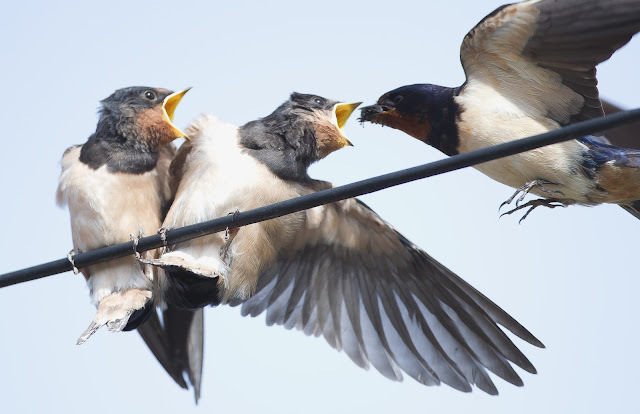 We legged it along the track to meet the mans wife who said they had just flown. My heart sank but was risen again as an incredible butterfly flew in over the trees and onto the Buddleia. At last I had seen my first Swallowtail butterfly!! 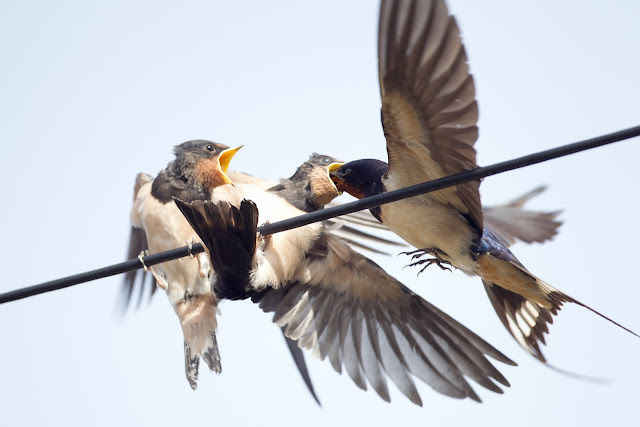 The other one came in and as they flew up they had a little fight right above our heads. 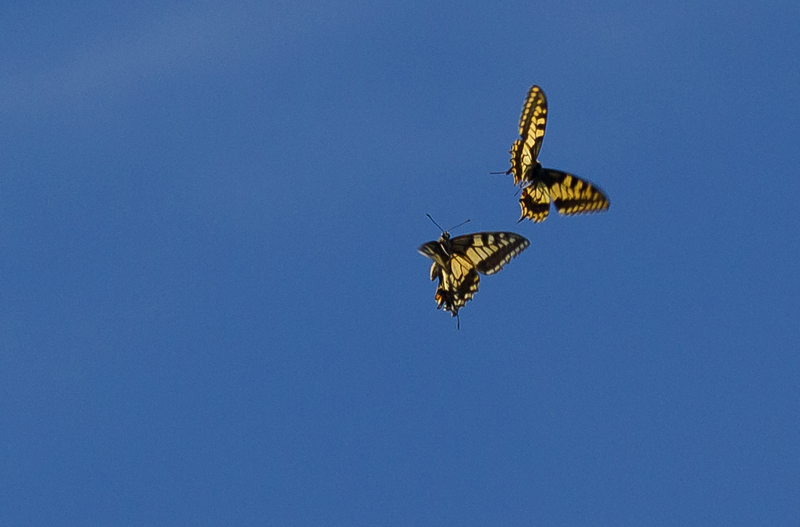 I chose this as the photo opportunity as they were too high on the Buddleia and I snapped away as they soared above us. Not the best results but they will do as a record. 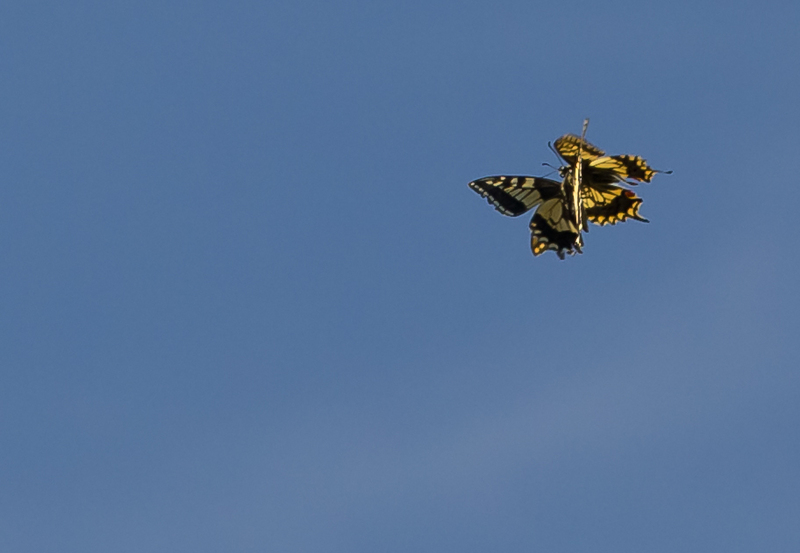 Swallowtail Butterflies, Strumpshaw Fen RSPB, Norfolk. Swallowtails, Strumpshaw fen RSPB, Norfolk. We then went to Burnham Overy Dunes and after a birding the site for quite a while I got pointed in the right direction for the now showing Icterine Warbler. We then went for the Citrine Wagtail at Weybourne but we unfortunately dipped this by minutes. The following day we tried to find the Citrine Wagtail but again we failed. Sea watching produced a couple of Arctic Skuas and a Bonxie, along with a steady flow of Gannets, Sandwich Terns and Fulmar.. A chap pointed us in the direction of a fantastic place called Warham Camp and we spent a couple of hours here enjoying the Chalkhill Blues, Brown Argus, Common Blues and the odd Wall Brown. Then after a pit stop at the Wells Real Ale Shop we went to Salthouse and sea watched for a while before seeing another Wryneck (which was just as confiding as the Strumpshaw bird) just down the beach at Gramborough Hill. On the pools near the pool was a Dunlin and Knot too which seemed to like having their photo's taken as they allowed photographers to get very close. 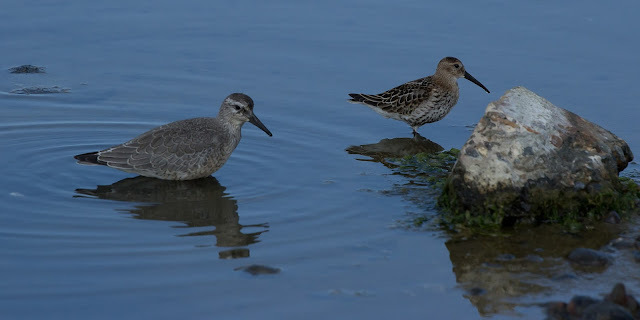 Knot and Dunlin, Salthouse Beach, Norfolk. Another surprise of the visit was a large Old Lady Moth which Leila had found in her van the previous day. She had kept it and we released it that night after taking a few pics. We returned home on the Friday and so on the Saturday Matt and I were joined by Sam Candy and John Friendship-Taylor to go to look for butterflies in Oxon and Bucks. 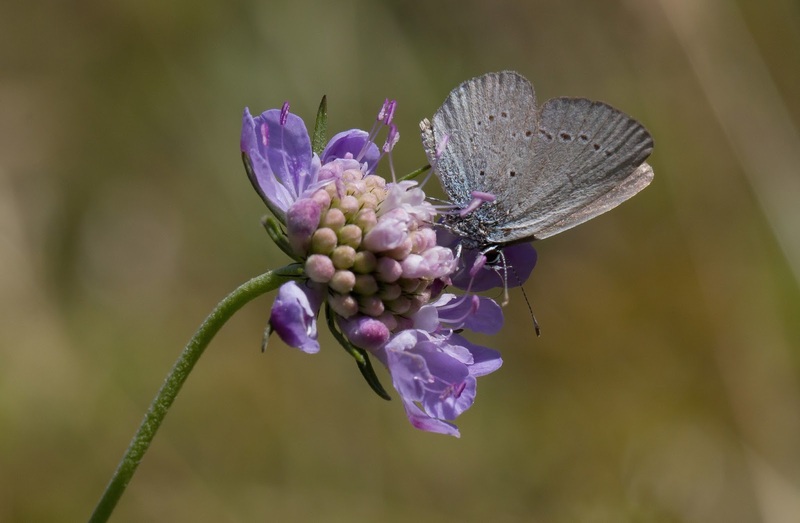 Our first port of call was Yoesden Bank in Buckinghamshire for Adonis Blue and as we walked up through the churchyard Common Blues could already be seen everywhere. 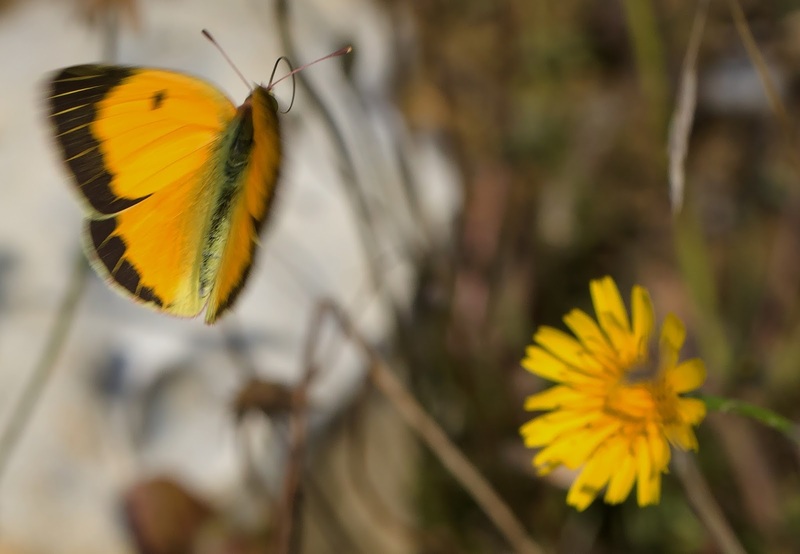 As we explored the bank the sheer wealth of butterflies here was staggering. Common Blues were all over the place as were quite a lot of tatty Chalkhill Blues but it wasn't long before we found our prize. I have to say that the Adonis Blue easily rates as one of the best looking butterflies I have ever seen. 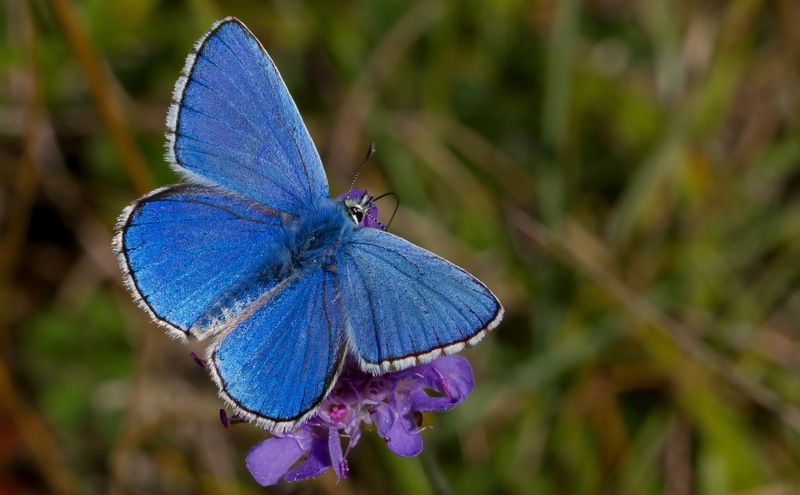 No wonder it is know as the "Adonis" Blue as it's blue colour is staggering even at a distance. Adonis Blue, Yeosden Bank, Bucks. 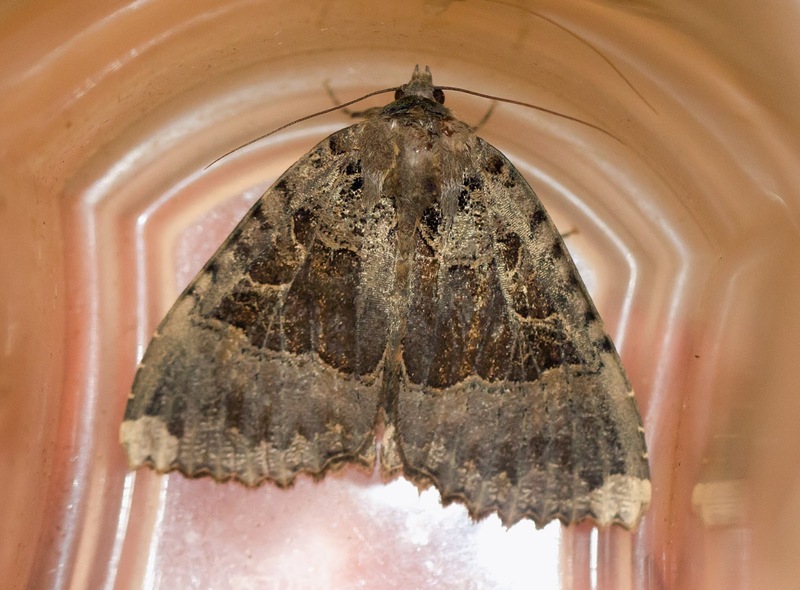 The find of the site though has to go to John Friendhip-Taylor when he saw a tiny little butterfly whirl passed and land on a bush. 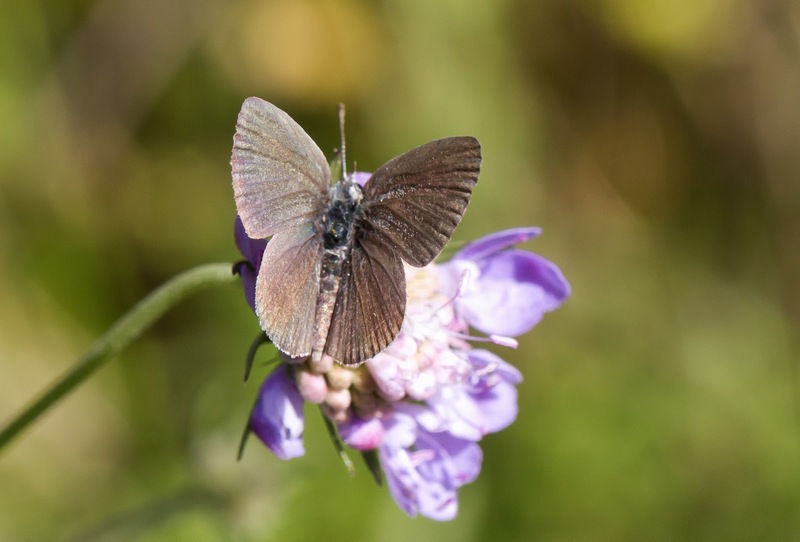 He had found a second emergence Small Blue which luckily stayed long enough for everyone to get back and see. 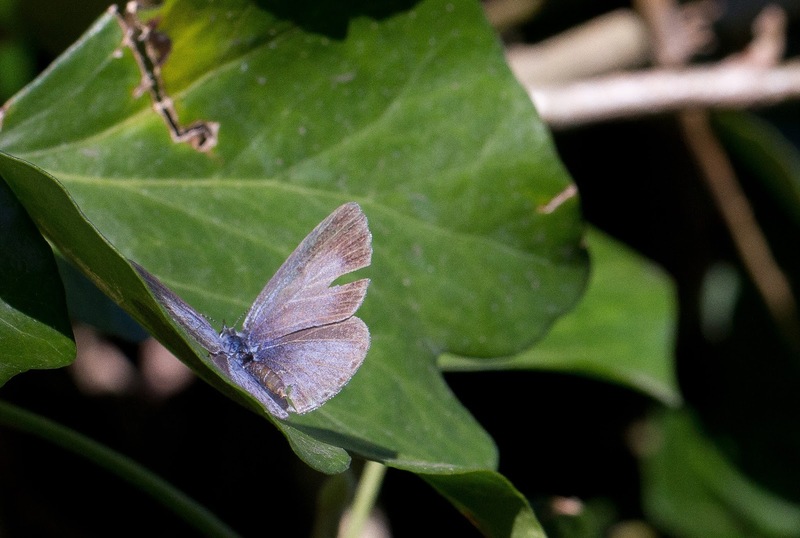 Small Blue, Yeosden Bank, Bucks. We left the site and as we were having a bite to eat in the churchyard another Blue could be seen flitting along the hedge. Closer inspection showed it to be a Holly Blue and oddly only my second of the year. Holly Blue, Radnage Churchyard, Bucks. Holly Blue, Radnage Curchyard, Bucks. We left here and popped into Aston Rowant to hopefully get Matt to see the Silver Spotted Skippers. Luckily they were in abundance and I also managed to find another male Adonis Blue here which Sam used to get a bit of photography practice. A Clouded Yellow did a fly pass and as I met up with John Friendship-Taylor to have a chat we turned round and noticed Sam had the Adonis on his finger. As we walked up to him it became apparent that this little Adonis Blue for some reason liked to land on people. In fact we all got shots of it perched up on ourselves whether that be our fingers or even our heads. In fact in order to preserve the population here we had to prize it of Sam's head and place it on the grass otherwise I think it would have accompanied us home. Adonis Blue on my thumb, Aston Rowant. Adonis Blue on my head, Aston Rowant. I also couldn't resist one last shot of a Silver Spotted Skipper as I made my way up the bank to leave. 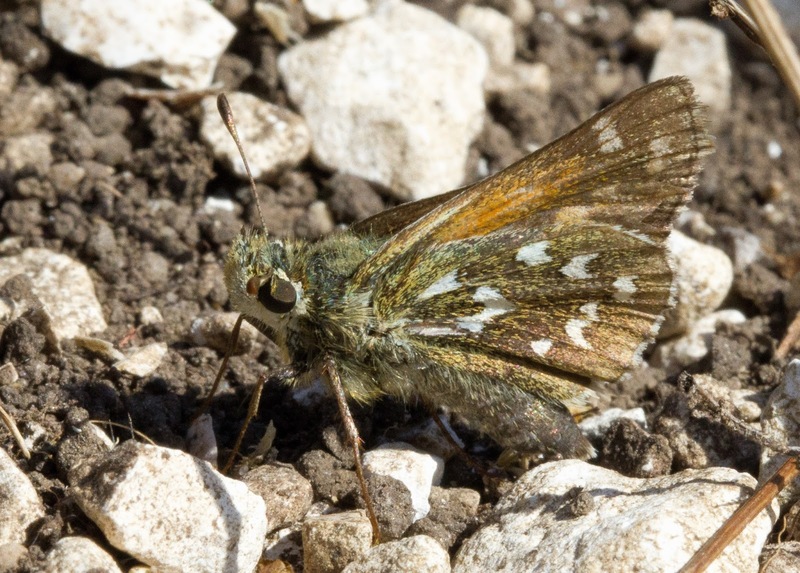 Silver Spotted Skipper, Aston Rowant. We headed to Otmoor RSPB after this but our luck ran out. 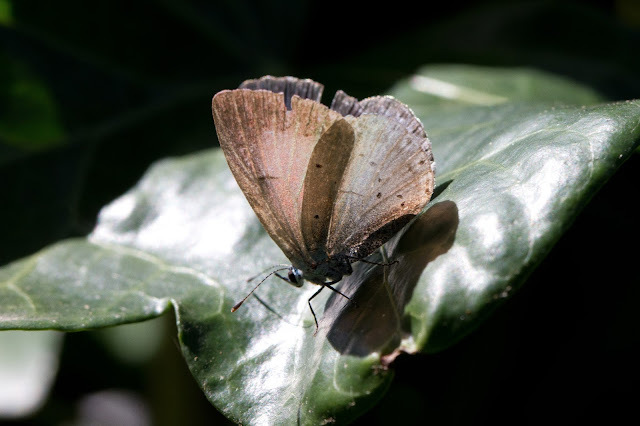 We despite spending a couple of hours along the Roman Road we couldn't find any Brown Hairstreaks for Matt. 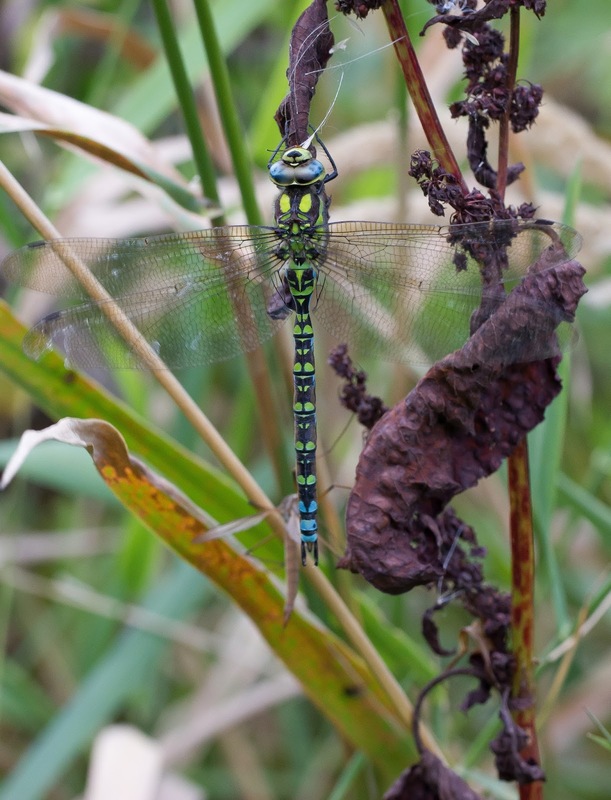 We did have a nice Southern Hawker as a consolation prize though. Southern Hawker, Otmoor RSPB, Oxon. On the Sunday Matt, me, John Friendship-Taylor and Sam drove out to Norfolk again to meet up with Jon and Kirsty who were already there celebrating their wedding anniversary. En route we couldn't resist starting at Lynford again but despite a thorough search we couldn't locate the Two Barred Crossbill and we left the site to head up to the coast to meet Jon and Kirsty at Kelling. 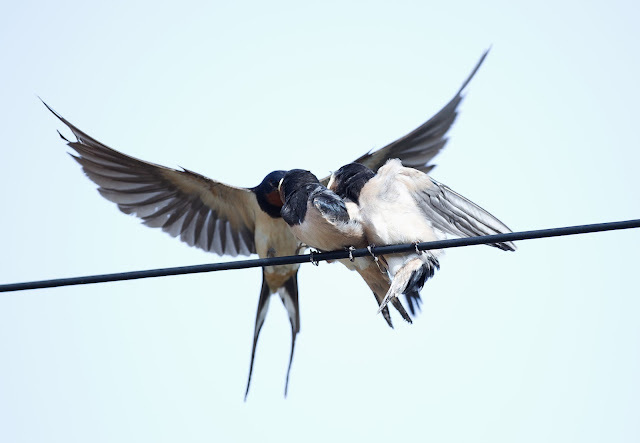 While everyone was saying hello to each other I noticed a pair of baby Swallows being fed by their parents on the wires overhead and Jon very kindly allowed me to borrow his lens for some shots. From here we headed to Beeston Bump to try and find the Red Backed Shrike but once again we dipped. John Friedship-Taylor did manage to flush up the previously reported Wryneck from the path though which was nice as it was a lifer for Sam. It then skulked about in the bushes allowing a few other birders to see it. We then headed to the pub and after a meal we spent the rest of the day at Titchwell RSPB reserve. Lots of waders were here and was nice to see so many Curlew Sandpipers with a few Little Stint in the normal mix of waders. A Spoonbill was snoozing on the scrape too and as we entered the hide there were a few Ruff and a Lapwing trudging through the mid in the now fairly strong wind. We then sat in the dunes and spent the last part of the day sea watching. We didn't see much for what seemed like ages. A few Gannets here and there and the odd Fulmar gliding passed seemed to be the highlights. Then a group of six Great Skuas drifted passed while an Arctic Skua, a couple of Eider and a Common Scoter floated on the sea. I gave my scope to Sam so he could have a go at sea watching and I wandered a little way along the beach to stretch my legs. As I returned I saw John Friendship-Taylor excitedly waving and as I quickly approached he exclaimed "Storm Petrel". I grabbed the scope and quickly saw a small bird flying over the tops of the waves. The square tail, squarish white rump and complete dark plumage across the top of the wings showed in no doubt that we had just seen a European Storm Petrel. I sent a text to Kieran who rang straight back exclaiming just how good a Norfolk bird that was. While we watched it zip passed we were happy enough to have it as a lifer for all of us but little did we know of the significance of seeing one along this stretch of shoreline. The guy who was behind us (and had saw it first) had already rang the birders at Holme and as we reached the car park he met us to say that he had just had a call to say it had been seen there too. 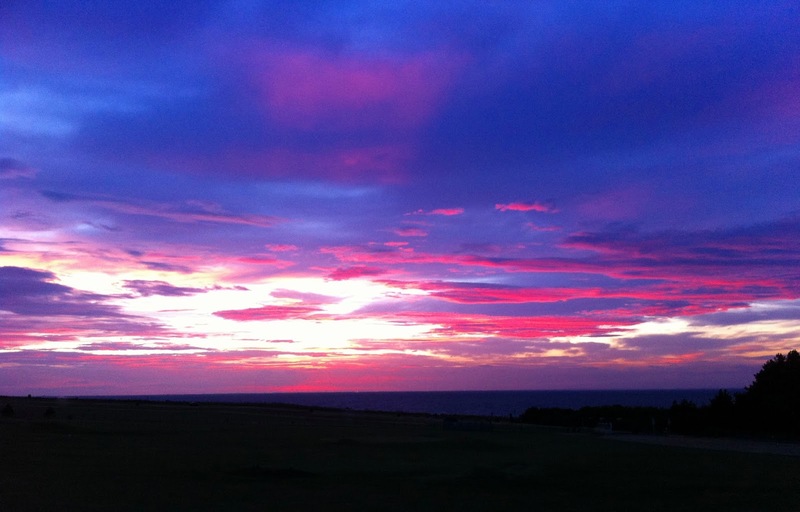 We left on a high knowing that we had just seen a bird that often takes people a very long time to see in Norfolk and we remarked on how lucky we had been almost all the way home, but we did of course stop to admire the dramatic sunset near Hunstanton as we went passed. This was Matt's last day down here and the following day he left to go back home to Scotland. It had been a short but incredible week!